For the Marketing Manager resume example, here is the profile of Joey Tribbiani, who is a 5+ yr. experienced marketing professional. 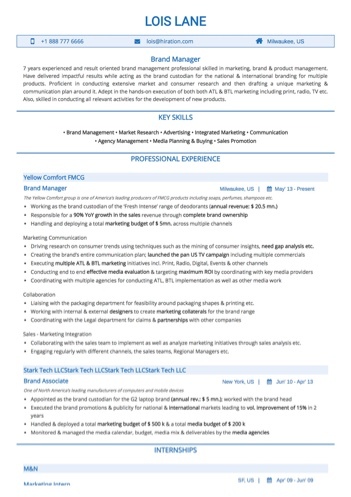 This Marketing Manager resume sample demonstrates multiple skill sets including brand building, product launch, marketing campaigns etc. For the Public Relations (PR) Officer resume example, here is the profile of Clark Kent, who is a 7+ yr. experienced PR professional. This Public Relations (PR) Officer resume sample demonstrates multiple skill sets including PR strategy, press management, media queries etc. For the Advertising Manager resume example, here is the profile of Chandler Bing, who is an 8+ yr. experienced advertising professional. This Advertising Manager resume sample demonstrates multiple skill sets including advertising strategy, TV commercials, sales growth etc. For the Advertising Associate resume example, here is the profile of Stan Marsh, who is a 3+ yr. experienced advertising professional. 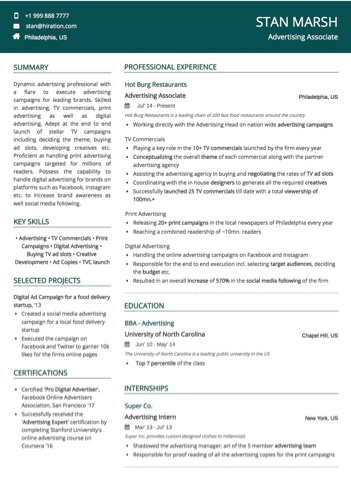 This Advertising Associate resume sample demonstrates multiple skill sets including TV commercials, print campaigns, digital advertising etc. For the Marketing Consultant resume example, here is the profile of Beth Smith, who is a 7+ yr. experienced marketing professional. 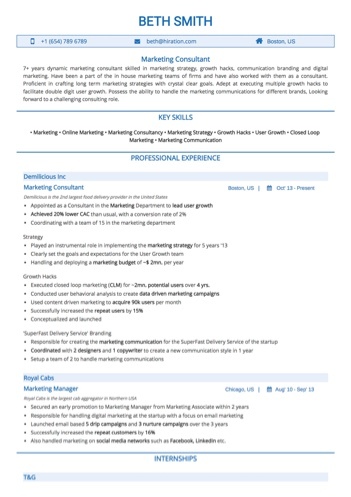 This Marketing Consultant resume sample demonstrates multiple skill sets including marketing strategy, growth hacks, online marketing etc. 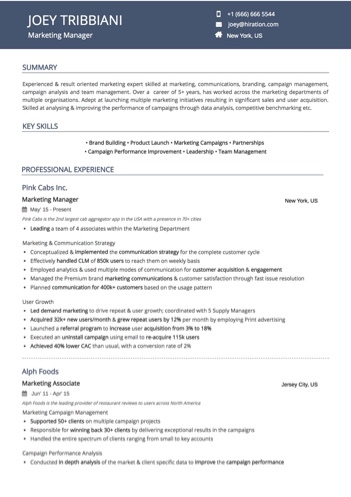 For the Marketing Associate resume example, here is the profile of Lily Aldrin, who is a 2+ yr. experienced marketing professional. 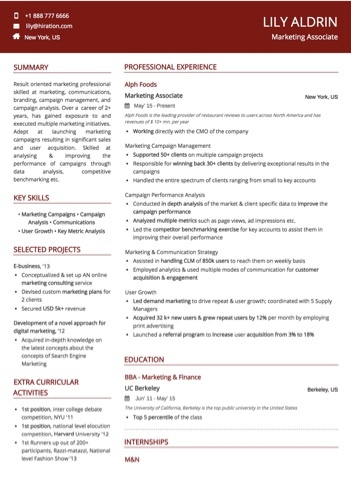 This Marketing Associate resume sample demonstrates multiple skill sets including marketing campaigns, campaign analysis, communication etc. 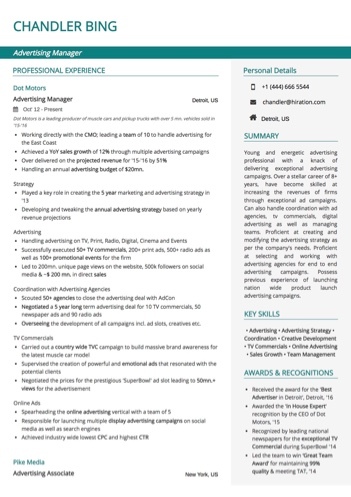 For the Online Marketing Manager resume example, here is the profile of Eric Cartman, who is an 8+ yr. experienced digital marketing professional. 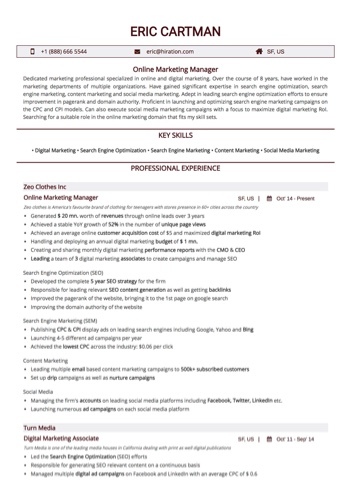 This Online Marketing Manager resume sample demonstrates multiple skill sets including SEM, Social Media Marketing, Content Marketing etc. For the Brand Manager resume example, here is the profile of Lois Lane, who is a 7+ yr. experienced marketing professional. This Brand Manager resume sample demonstrates multiple skill sets including brand management, market research, advertising etc. For the Marketing Head resume example, here is the profile of George Costanza, who is a 21+ yr. experienced marketing professional. This Marketing Head resume sample demonstrates multiple skill sets including marketing campaigns, brand building, leadership etc. 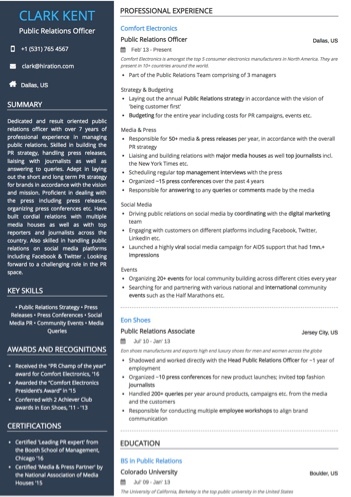 For the Online Marketing Associate resume example, here is the profile of Stewie Griffin, who is a 3+ yr. experienced online marketing professional. 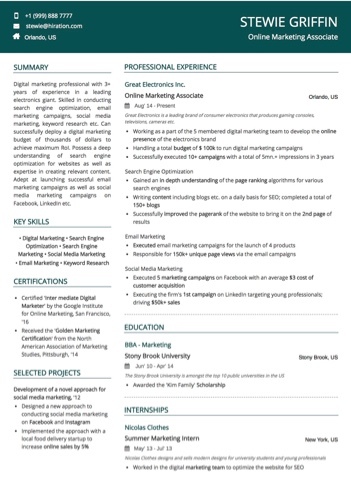 This Online Marketing Associate resume sample demonstrates multiple skill sets including digital marketing, search engine optimization etc. For the Public Relations (PR) Associate resume example, here is the profile of Hermione Granger, who is a 3+ yr. experienced PR professional. 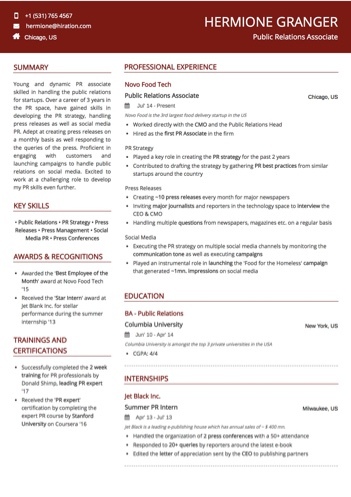 This Public Relations (PR) Associate resume sample demonstrates multiple skill sets including Social Media PR, press management, press conferences etc. 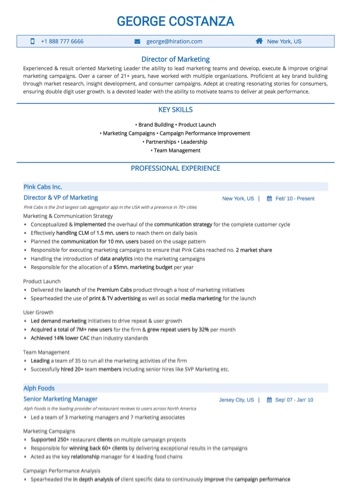 For the Marketing Analyst resume example, here is the profile of Patrick Suez, who is a 4+ years experienced Associate Sales Support. 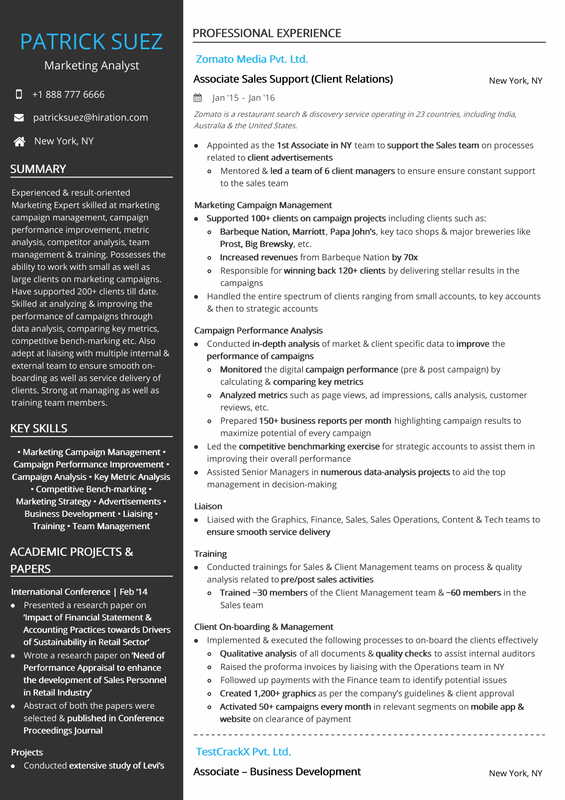 This Marketing Analyst resume sample demonstrates multiple skill sets including campaign management, performance analysis, client management, etc. We are marketeers, one of the top paid actors in the big screen of marketing ball game ! But... Hold on to your horses ! Because where the entry barriers are low... competition becomes difficult. Too many applicants for every single job. In that case it is rather amazing to realize, the big role a Marketing Resume can play in a marketeer's career goals and development. Of course, it ultimately boils down to how you perform in the subsequent series of Interviews, how well the employer is able to connect with you, whether your skill set matches the requirement, group discussions or Written tests. But, what if, you never make it to that level? What if you are that one person whose marketing resume has exactly the same skill set as required by the company but you are not able to show up just because the resume was never shortlisted. What if you are much better than others in terms of participating in a group discussion, but Alas, you have not even reached there to talk. you are broadly noticed with your Resume as the cover page of your professional journey with only few minutes (Oooops seconds in our case!) in the recruiter’s hands. Marketing world is the most paying and gratifying a job. In terms of money and glamour, this field always shows a bright future. Digital Marketing is another sub field of marketing with bright prospects. To kick start this ever promising journey, a candidate has to work hard on his marketing job resume & digital marketing resume for marketing & online marketing jobs. 2. How to write a Marketing Resume: Section 2: Marketing Key Skills ! 1. How to write a Marketing Resume: Marketing Career Summary: Be Quantitative, Show Numbers & Use Numerals ! Well, what exactly is this section all about? A summary of work experiences….. or Education…. Or your soft skills or technical skills? What exactly is the priority here? Have you ever noticed the fact that when ever you must have picked up a resume for marketing or any generic resume to read…. What are the first 3 things you notice ? Yes you very much got it right ! Evidently, it appears to be the most simple one as well. But it is tricky… because candidates often write career objective in this section and not what they can deliver. You will eventually discover in this article , you need to convey your problem-solving attitude and not really what your objective is unless you are a fresher. Your marketing job objectives are hidden inside your marketing resume summary but not explicitly. We understand that you are just blinking at the screen thinking what have you done with your resumes in the past. It is just alright. We all go through this learning curve. Marketing resume summary is a perfect balance of what you have done hinting at what all you can deliver. In nut shell it is the answer to what all problems can be solved. "Dynamic professional with over 2+ years of experience looking forward to render my skills: Email Marketing Domain, Account Management, Team Management and Client Relationship to a creative work space. My objective is intensified to use my managerial skills in leading marketing function of the company." Summary also depends on how much experience in the relevant field you hold. "I am an experienced Sales Expert and Marketing Professional spearheading teams across various functions to achieve business growth and brand recall. My efforts have helped the organization to achieve the respective goals w.r.t promotions, vendor management, growth, etc." "6+ years experienced Sales and Marketing Professional spearheading a team of 10 members across functions like digital marketing, graphics, analytics, etc.to boost revenue by 15% in 5 months. Managing vendors and over-seeing cost control to drive profitability"
Which one would the marketing recruiter prefer? We are sure the second one ! Second one is like reinveting the wheel. Your capabilities as a marketeer shall show in terms of outcome achieved. Not by the words meant. Because the recruiter is interested in what result was achieved. Generally speaking, one of the basic rules of content writing is to put information in numerals. Like '4' in place of 'four'. Human mind registers facts more than the theory. Numbers and numerals make more sense than words. This is the way we work. And specifically when you are in marketing, you can really really change the game by using more quanities ! ✿ Put the first line as power driven simply by using adjectives like result-oriented, meticulous, value-driven, etc. You might be one of those candidates who have changed industries and profiles. It is quite possible that you started your career with financial auditiong but today you are the ace of marketing. Then, the question arises that whether the finance audits should form the part of Marketing Skills in your resume for marketing? 1. The skills which you are going to highlight should definitely match up to the requirements of the marketing job. Dream Recruiter's Job Description:- “Responsible for developing, implementing and executing strategic marketing plans for an entire organization (or lines of business and brands within an organization) in order to attract potential customers and retain existing ones." So, the idea is to relate your marketing skills to what recruiter needs and make the grade ! While there is nothing called as wrong skills but the idea is to showcase marketing oriented skills and not generic soft skills which everybody has. 3. Skills to face the machine recruiter, ATS: i.e. Phrase them Right or use exact keywords. "Your candidtaure does not fit out requirement. All the Best for your job search"
Now, who would you blame? A machine which ATS essentially is? So given the fact that many of the companies are using ATS these days, why not lets crack it. Best bet in cracking the ATS is to use keywords which exactly matches up the numbers, abbreviations and words in job description mentioned. "Marketing Job Description: Day-to-day tasks include managing and coordinating marketing and creative staff, leading primary market research efforts to generate MQL and uncover the viability of B2B business, managing 4Ps of the product and liaising with media organizations and advertising agencies"
What the heck is MQL, right? Well, a very important jargon used in Marketing industry which means Marketing Qualified Leads. This is used in place of potential leads. "Overseeing a team of marketing and creative staff to create MQL, manage B2B business and secure key accounts. Hghly skilled at strategizing 4Ps by effectively coordinating with media organizations and advertising agencies." Needless to say, do not over do it just to clear the ATS test, because eventually you have to justify what you are writing. It is of paramount importance to let the recruiter know what technical skills you possess. ► Dynamic industry results in change of technical tools used. So it is important to highlight the recent upgradations you mastered. Pro Tip for writing a fantastic resume: Know your recruiters before they know you ! Well we know it is a bit common sense topic, but believe us, we often forget about this common knowledge. It is important to understand what skills the recruiting company is looking forward to in the candidate. You can gauge this knowledge from the job description of the desired job and design your marketing resume accordingly. 1. Responsible for developing, implementing and executing strategic marketing plans for an entire organization (or lines of business and brands within an organization) in order to attract potential customers and retain existing ones. 2. Day-to-day tasks include managing and coordinating marketing and creative staff, leading market research efforts to uncover the viability of current and existing products/services, and liaising with media organizations and advertising agencies. • So you see, in both the cases your marketing resume highlights change as per the recruiter you are aiming at. So do your homework on the recruiter to frame appropriate marketing resume skills. Let us first talk about generalist statistics prevailing in the market around a recruiter. Readability of any document depends upon the time availability with the person who is targeted. Clearly, it is an amalgamation of high number of applicants per job, too many CVs received, less jobs available and less time available for screening. In our case, volume of resume marketing received is higher than average because too many people are interested in this lucrative career. For example: volume of digital marketing resume received few years ago is increased with the onset of digital marketing platforms like Facebook, Twitter, et cetera. To be precise, the time availability per resume today is meager 6.25 seconds according to a recent study published on Forbes !! Now in this time, if your resume for marketing is not concise yet informative then your chances are rather lean in getting to the interview table. Not only this, there are machine recruiters, i.e. companies which use ATS ( Applicant Tracking System) for first level screening before it reaches the eye of a human recruiter. This is nothing but software which looks for keyword matches with the respective job profile. That does not mean that you can clear it up just by stuffing key words. Because ATS can penalize you for over stuffing keywords just the way Google does it. So it is a fine game of keywords, crisp information, relevant details, clearly formatted, correct personal details, et cetera. Too much to be true, right ?? Relax. We are definitely not here to scare the candidate with statistics and realities. We are here to help with exactly how a candidate has to build his resume for marketing in the righteous and easiest way possible. The Whole point is that power verbs have a better and powerful impact on the reader’s mind and that is why the name. c. Resume length: Even if your work experience extends to good 25 years, then also your total resume should use maximum 2 pages. That is it. Who would read a 4 pager resume for marketing in a few seconds time frame. Even if time is more, a voluminous resume marketing looks messy and too much information to download. Let us understand how to HIT THE BULL’S, AAHHHH I MEAN RECRUITER’S EYE ! This is to understand that this proves to be the most critical part of you and your resume. The least we can say here is that you are first known by your name and then your job title. “Job Title”- are the words which catch Recruiter’s attention in the very first place and become exceedingly crucial in your quest of writing the right one! And it is definitely not always what designation you are currently holding in your career. If it would have been that easy then this section would have never been constructed. Read carefully, what all research goes into writing a JOB TITLE. 2. Match the position aimed at with appropriate key words given in the Job description. So, may be the recruiter is using terminology like Application for ‘Senior Manager- Marketing’. In this case your job title in the Marketing resume would become ‘Senior Manager- Marketing’. But this is again a tricky game. You have to do it taking care of the number of years relevant to such a profile in the industry. You cannot just go ahead and write a job title which requires years of experience way bigger than yours. 3. Make sure that you do not look like making up things just to catch recruiter’s attention. It should look as genuine as possible. In the growing digital world, it is imperative that you are most probably going to apply online for the job. Hard copies is history. No loss of Formatting.appearance: Word document is displayed in different formats in different systems and laptops. This makes it a very poor format for the risk of re alignment of points and information. Thus, Not only can you secure your PDF so that it can only be read and not altered, you can also be sure that it will display correctly every time. PDF is ideal for document exchange between users. 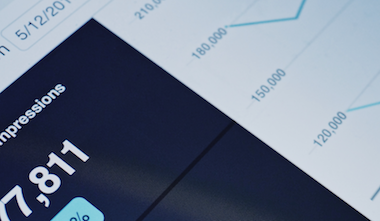 Not only is it a compact format, but it can also store metrics and information about its own appearance (layout, fonts, content, color, etc.) within the document itself. This means that it may not have to rely on the fonts and settings that may or may not be installed on a user’s computer to display properly. High Quality Print-out: If you are using an info-graphic marketing resume with display of different numbers achieved though a pie-chart or even if you are just displaying your own image, you need a document which displays high resolution images correctly. Here comes the importance of a pdf document. PDF file assures you that what you see on your screen is exactly what you’ll see in your print. PDF files are accepted by professional printers, whereas Word DOC files usually are not. In addition, PDF’s print-ready file transfer makes it easy to send a print-ready file to a printer in another department or even another country with little or no rework needed at the other end. Safer: Your resume is a document which documents your entire career history. It is your real journey and will be later picked up to match it up with your work and education documents. Thus it is very vital that your resume must retain their integrity and security. With the PDF format, you can secure your documents so that no one can change the wording of an application or the terms of an agreement. Best way to have the best of both worlds is to start writing your resume on a word document to enable spelling check, grammatical errors, sentence formation, spacing et cetera. And once you are done save it in the pdf format and check the view once before hitting it off. Your writing skills will convey a lot of information around how would be your verbal communication. For that matter, we are right now talking about a stage where the recruiter does not eknow you. Recruiuter has never talked to you. You might be just great in your spoken English, but right now your only voice is your resume. Your resume will authenticate how much you would be able to accomplish if you are given the job. Agreed, you must be a great orator. But does it even matter at this time? At this stage, what matters is your written English. You are going to do lot of coordination and liasing in your role as a marketing manager/executive/associate etc. You are certainly going to make lot of presentations for the stake holders, isn’t it? Well well well, if your resume consists of silly errors pertaining to verbs, syntax, tenses, spellings, framing of sentences, et cetera then how under the sun could you think of getting shortlisted for a marketing profile which requires you to be meticulous? Though this rule sounds valid for all the profiles, we are specifically mentioning about this here because marketing is all about marketing your product. It is all about lot of writing and talking. It is very much about communicating what you think is correct and what you think is apt. It is all about a great strategy and a great communication skills to convey that strategy. When you are dealing with development of collaterals or updating a status on social media channels like twitter, or involved in a press release, your writing quality and the command over the language becomes extremely important. So your mistakes in the resume would cost you a shortlisting because it might make the recruiter feel that your work and final drafts would have to be given too much quality checks! It is imperative that you have taken the degree in the field of marketing if you are entering this industry. We are not here to guide you towards what course you should study. But rather what should be highlighted in the resume. So for example, if you have pursued an MBA course with dual specialization in finance and marketing then it becomes crystal clear that you do not have to really mention Finance in your resume. Also, it is generally said that recruiters are impressed with brand names mentioned on the resume pertaining to schools/ college you attended. But this is also absolutely true that a C grader from top school/college ranks lower than an A grader from an average school/college. So in this case, just flaunt what you have and better if you have both ! Usually, if you already have 4-5 years of work experience, your education section shall be pushed downwards and your achievements at work place become more relevant. But still, if your degree is not aligned with marketing field, then be ready for the question… why did you study finance and pursued a career in marketing instead of finance? Very luckily, it is easier for a marketing person to give information in terms of numbers or ratios or percentage as compared to somebody in HR. You could mention the number of vendors you dealt with to get the printing job done. You could mention how many likes you generated as a digital marketer on facebook platform. You could indeed mention the number of customers secured with your marketing efforts. The whole idea is to give as much information as possible in numbers. Numbers are the most easy form of conveying information. The information is easily comprehended and processed by the recruiter. Numbers are identified with your achievements and confidence. Long paragraphs as we said before is a total no-no. Numbers included in one liners is what is ruling ! Managed company’s Facebook page to grow likes from 1000 to 5000 in this much time span. Bucketing is nothing but the way you group the information under the relevant headings. Sometimes candidates are thoroughly confused around what skill set they should write which demonstrate the best of their capability and present what they have to offer. our digital marketing campaigns across all digital channels. Develop and execute consumer & B2B marketing strategy. Prepare regular performance reports on marketing campaign metrios. So as we just noticed, the buckets are essentially what the company has asked for and of course has to incorporate relevant bullet points for a particular work experience. Buckets make it extremely easy for the recruiter to notice your resume and are usually impressed with the exact information you have provided them with which they are looking for in a candidate. A marketing specialist wears many hats in his role to drive marketing of a product/service. Candidate might be struggling with what skills to showcase. By bucketing the work experience, many things come out to be crystal clear in terms of what exactly are the skills being offered. So for example, thorught the buscket of Team Management, the underlying skills which comes out is Leadership and Mentoring. This skills is highly required in any position of marketing which you might be applying for. So lot of skills come up from the buckets used like meticulous detailing, leadership, soft skills, assertiveness, problem-solving, troubleshooting et cetera. So if you want to be promoted to a position of that of a marketing head from marketing manager, put emphasis on big-picture thinking and leadership as a way to solve problems. Shall we ask that the first and foremost goal of any resume is to solve a problem which recruiter is trying to solve? And the fact is that each problem requires a corresponding skill to solve ! Like for example: they need to revive a dull sales team. This needs the skill of leadership. Or may be they want to streamline processes to bring efficiency. This requires a skill of meticulous analysis and organizing. Now how to highlight these skills in the marketing specialist resume? You might be a great guitarist or say a singer, which is good to be mentioned in a resume … But if specifically we talk about marketing specialist resume, your extra -curricular achievements which display the skills needed in a marketing job would always be better and appreciated. So, if you are a theatre artist then your capability of working in teams is highly exciting and admirable in for marketing recruiters. Similarly, if you are in debates then your capability to convince on your ideas and opinions and your general awareness would come forth in the marketing specialist resume. Well, here is the key. When we talk about layouts, we often refer to the colour codes and fonts, bolding and other aesthetics used to present the final document. The formatting of your marketing resume talks volumes about you, your personality, the way you think and feel and other things. We have seen people using really gaudy color palette on an otherwise decent resume. If you are a marketing person, then you must understand the importance of presentation. Your marketing resume should not look like that of somebody who has handled kindergarten with flowers and petals displayed over the document. The final formatting of the resume represents the person you are. And the way you think. Specifically since it is marketing resume, you have to be extra careful around how your resume uses colours and fonts. May be the recruiter thinks that this is the way you are going to do the presentations of the company or this is the way you are going to present the product of the company !